Eric Allen discusses Vikings coach Leslie Frazier‘s job status heading into Minnesota’s final home game of the season. This has nothing to do with the Eric Allen (ESPN) video discussing Frazier’s job status, although I DO THINK it is very much in the air. This is, contrary to my usual half-page ramble, going to be a relatively short comment. Just wanted to say this: At the end of this ESPN video discussing Frazier’s job, there are several little thumbnails to choose other videos to view. 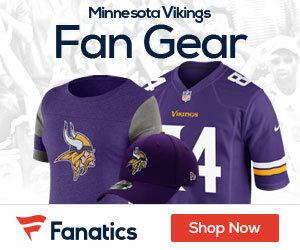 I clicked on Cordarrell (CflashP) Patterson highlights, and ENJOYED THE CRAP OUT OF MYSELF for a couple minutes of one of the most dynamic players drafted by the Vikings in a looonng time. CflashP is going to be a superstar. Hell, he’s ALREADY a human highlight reel!! I REALLY HOPE AND PRAY that Patterson is a Viking for a lot of years, and he re-signs when contract time comes around. The Vikings have made some really bonehead moves over the years, but grabbing #84 is one of the BEST they’ve ever made. SKOL VIKINGS! !